This is a Hadith (narration) from Prophet PBUH however I have not been able to find the Arabic text by Allah’s Grace will do so soon. Man cannot simply look upon or talk to or listen to or touch the Creator. Its vastness and majesty is beyond any mental or physical utility we possess. Just like a toddler needs to learn and be trained how to walk, a man must be trained and learn how to love and interface Allah. This learning comes from long exposure to trials of life and sensitivity of heart and mistakes of mind. Mankind is been made aware by Araqi, that he or she must learn how to interface their Lord via these veils. It is a shocking, trembling affair to come close to the Creator, we can not even directly look upon the sun!? Those who show relaxed TV poses of tranquility claiming in congruence with the Lord indeed are actors. The real deal is quite tumultuous and emotional. ‘Love’ is something in and of itself, independent of Mankind and the universe all-together. It is the power of Love that moves the human heart to desire people and things and eventually the Lord. These veils that cloak the Creator are there for wondrous many purposes, Araqi discovered several reasons as you will read later on. Araqi teaches, “The only way to remove these veils whether light or dark, is via love”. Prophet Mohammad PBUH told us that once a man climbed down a well to fill his shoe with water to avoid certain death from thirst, and when he came out of the well he saw a dog suffering from thirst and offered the water to it first. And then climbed down again to drink himself. Than man was placed in Paradise by Allah. If the love for a wandering dog can drop all these veils, imagine love for mankind, love for your woman, love for your family, love for your neighbors. And yes! Someday true love for your Creator. That moment you are entangled between Allah and Allah, and you forsake the people and the universe, now all things are done/taken/given by Allah to/from/to Allah. It was not you who gave money to charity, It was Allah who gave/offered the funds and It was Allah who accepted the funds and you were in the middle an instrument. It was not you who worshiped and praised the Lord, It was Allah who put the words of praise on your tongue and It was Allah who accepted/heard these praises and you were in the middle only a conduit. Araqi uses the Arabic word ‘Ajez’ which I translated into ‘desperation’. Again it being a poem there is an ambiguity. Does he talk about desperation meaning desperate to understand the nature of light and dark veils? Or desperation due to impossibility to unveil/surpass/penetrate these curtains? I will make sure my translation is checked by experts and if mistakes then surely revise and repost INSHALLAH. ‘Names’ and ‘attributes’ are phrases that are in need of deeper definition in English. At this point of time I translated the ‘Asmaa’ to ‘names’ that loosely means knowledge either given or by means of mental deduction or experimental observation. Personally I dislike the ‘names’ in English and I think at later day by Allah’s Grace to give a better definition for the English readers. This word comes from Koran with reference to the first human, Prophet Adam PBUH. Arabic word ‘Sifat’ was translated by others into ‘attributes’ which is a pretty good word. Example of an attribute is Ar-Rahim, which means “The Merciful”. Araqi claims that these Hijabs(veils) are made from either knowledge/existence e.g. we cannot escape the time-space therefore physical laws are a barrier between us and the Creator or feeding a poor person brings us closer to Allah so this is a knowledge that shows a barrier and how to lift it… or attributes like The Merciful i.e. Allah does not destroy us at a simple sin or just out of a whim Allah is The Merciful therefore this attribute is a cloak between us and the Almighty’s power to destroy all things. Arabic word ‘Ezzah’ was used which in English means rare precious as well as powerful respected and cherished. Perhaps lofty and dignified is a nice phrase. So the curtain of ‘Ezzah’ is for the most part is an attribute of the rare, precious and dignified Creator that separates It from commonly duplicated, worthless and lowly humans and objects. "When Moses came to the place appointed by Us, and his Lord addressed him, He said: "O my Lord! show (Thyself) to me, that I may look upon thee." Allah said: "By no means canst thou see Me (direct); But look upon the mount; if it abide in its place, then shalt thou see Me." When his Lord manifested His glory on the Mount, He made it as dust. And Moses fell down in a swoon. When he recovered his senses he said: "Glory be to Thee! to Thee I turn in repentance, and I am the first to believe." 1. “Zu-l Jalal Wal Ikram” meaning “The possessor of Majesty and Honor” (Koran [55:27]). 2. “Zhaat Alwah-in Wa Dosor” meaning “On (a vessel) built with planks and oakum” (referring to Noah’s Ark Koran [54:13], Essence of something being certain way or composed certain way. 3. “Zhaat Assodur” meaning “The very inner most thoughts and feelings of your breast” (Koran [3:148]), Ego or again essence of an ego. I do not know who is referred to by ‘Quwwatol Qulub” meaning the power of all hearts. Sufis believe that one reason we cannot see Allah is because It is every place commanding everything, similar concept to “trees don’t let me see the forest”. This over exposure is mentioned later on in his poem down the page. The other reason they cite is that Its light invades the universe with such intensity that blinds all things i.e. no one can see the Creator. Both the “over exposure” as well as the “blinding light” are considered by Araqi Hijabs (veils) cloaking the Creator. Since Allah is boundless and infinite, so is Its beauty. From moment to moment Its beauty never stales, rather varies infinitely from one fantastic beauty to other unbound beauty anew, afresh. If you walk around the universe and feel bored, nothing looks interesting, and then you are not seeing the ever-blasting beauty of the Creator i.e. you are afar. If you look upon a rose and lose your self and admire and adore the beauty, then you look upon a cloud refreshed with its splendor, you journeyed from one moment of beauty of Allah to another seamlessly. Although this happens to us in brief occasions, Sufis like Araqi were able to maintain that perception and all such feelings for years and years. This is the craft of Araqi. No one can verse poems like this. Like an inventor Allah is made manifest through a Wow-Effect when we look at Its handiwork and inventions e.g. DNA strands, deep space celestial structures. But when it comes to human affair or life, Allah hides Itself to examine us against each other. The ambiguity between being manifest yet so secretively hidden is the ambiguity that rules the universe as was described in Araqi’s Lesson 10. Try not to understand ‘why’ attempt to enjoy the beauty of ‘what’! Ask no questions because you are the answer. 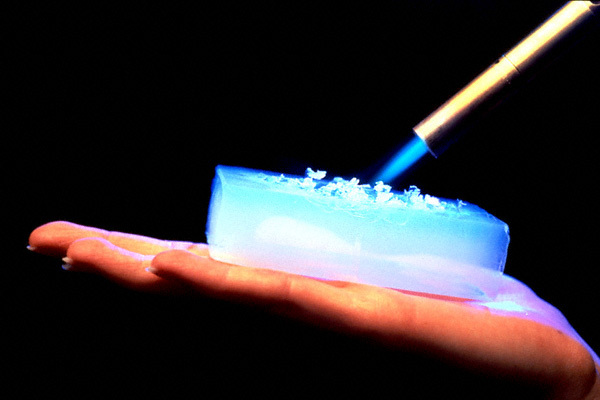 Background: A new material called Aerogel the lightest solid in the world and a super insulator is seen deflecting heat from a blow torch. Developed by Lawrence Livermore National Laboratory, California. 2003 © Peter Menzel Photography. I added this artwork to indicate that this almost transparent weightless insulator is an example to stretch our mind to imagine the seventy thousand Hijabs (veils) teenage Araqi was wondering about 700 years ago.